Some things are reserved for Nokias. Like dropping the device and cracking the floor instead, supporting tables that have shorter legs and going as far as becoming riot weapons. Yesterday’s happenings went even overboard. 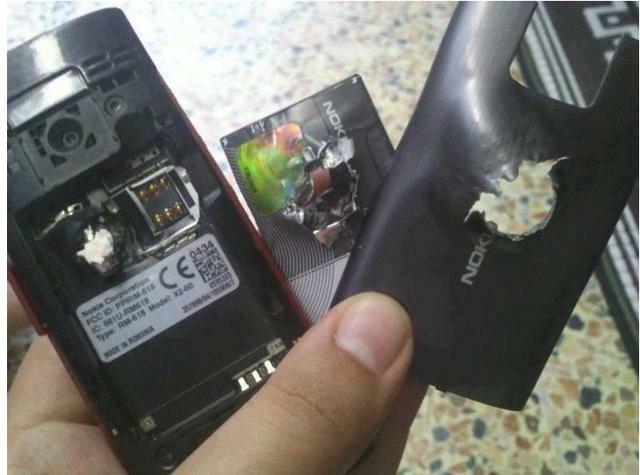 A Nokia X2 stopping a bullet from harming a user in Syria. According to Ubergizmo, a Facebooker reported an incident where they were recording events at the war happening in Syria and had this to report. A bullet just showed up on their phone and could not hack the Nokia. It was that strong. The device was Nokia X 2. The Nokia owner is said to have gone close to the war scene, with the phone almost right infront of their mouth, and a bullet that went his/her direction got stuck in the Nokia X2. Well how true that is would have to be left to imagination and “actual experts” So next time you are looking for protective gear, you might as well consider including Nokia X 2 in the shopping list. And thanks @jmwai for the tweet. Looks like the bullet ripped effortlessly through the front and exited in the back. Does the Nokia X2 come with a secondary camera or was this a Chinese version? it doesnt make sense at all..Only in Syria!